Historical tide guage data has shown that over the past century sea level has been rising and continues to rise at an increasing rate. A higher sea level is especially problematic for the east coast of the US where the land already suffers from erosion, development, and subsidence (a settling of sediments and sinking of land). 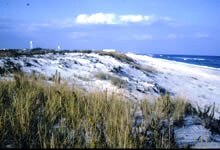 At Sandy Hook, a unit of Gateway National Recreation Area in Highlands, NJ, sea level is expected to rise by at least 2 feet by 2100. Half of the sea-level rise at Sandy Hook is due to the fact that the land is sinking. Sea-level rise is important to consider in understanding the dynamic changes along the coast. The components of any sea level changes include eustatic change (global change) and local change. Eustatic change results from global warming producing thermal expansion of water molecules (from the melting of the polar ice caps), adding volume to the ocean basins. Eustatic rise is currently estimated at 2 mm/yr; local rise varies and is approximately an additional 2 mm/yr in New Jersey. Local change may include compaction of sediments, subsidence (sinking of the continent), and sediment loading.